Scrum WithStyle was delighted to bring to Australia the Certified Agile Leadership program with the world’s most experienced CAL Educator, Michael Sahota, CEC. Credential I (CAL1) courses ran in April, May and September of 2017 with the world’s first ever Credential II (CAL2) in October 2017. Feedback has been exceptionally positive. 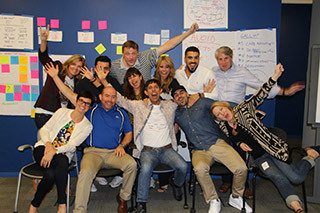 Michael Sahota’s CAL1 experience is an intense 2 days of deep exploration into leadership, organizational growth and the connection of culture and high performance organizations. During this experience, participants will undergo a process of letting go of existing behaviours that block their abilities to be an effective leader. They will explore models of culture and receive a playbook to guide the next steps on their journey of creating high performance organizations. Your success as a leader in an Agile organization requires looking beyond Agile itself. It requires a deep understanding of your organization and your own leadership path. To equip you for this journey, you will gain a strong foundation in understanding organisational culture. From there, you will learn key organisation and leadership models that will allow you to understand how your organizational culture really works. Now you are ready to start the journey! You will learn about organisational growth – how you may foster lasting change in your organisation. Key is understanding how it invites change in a complex system. You will also learn about leadership – how you may show up more effectively, and how to help others. Participants are expected to complete 2 hours of videos and readings in advance of the training. Then there is more time to focus on discussion and exploration. The reading guide will be shared with participants after registration. As part of the tuition, you will receive the Certified Agile Leader 1 (CAL1) certification from the Scrum Alliance. As there is no test, the only requirement for certification is your full participation in the class. This means that you will need to schedule any travel so it does not conflict with scheduled class time. Late arrivals and early departures are not advised as it will interfere with creating a safe learning environment for others and will make certification discretionary. To register one or more participants for this course, simply select the “BOOK NOW” button at the top of this page. Via our secure external booking service.